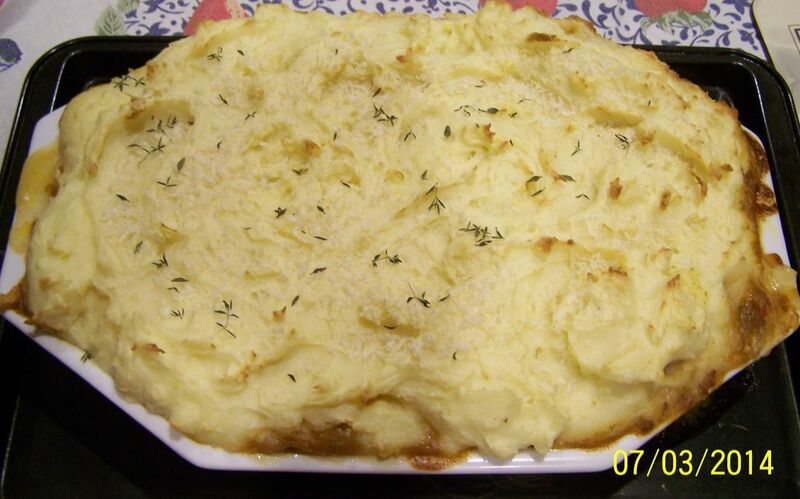 I have tried a few Cottage Pies over the years and I have never loved any of them. They were all sweet-ish, had too many vegetables-even for my liking, they all contained Worstershire sauce, which although I don't completely dislike, I just am not a real fan of the flavour. They just were not special in any way. Then I saw Manu Feildel's recipe on the cover of Taste magazine. Had a read of the ingredients and thought I'd give it a try. His version seemed more like the food I grew up on, no Worstershire sauce, not a ridiculous amount of vegetables in it either. Now I know if your kids don't eat vegetables you'd try to sneak them in, but my kids love vegetables so I don't sneak them in unless it is to improve the flavour of a dish. To this dish I added mushrooms, not for nutritional value, but because I love the flavour they add to a dish. So I have to say my family LOVED this recipe. It was truly a lovely dish. For something so simple to make with very simple ingredients, to taste this good, was really exciting. 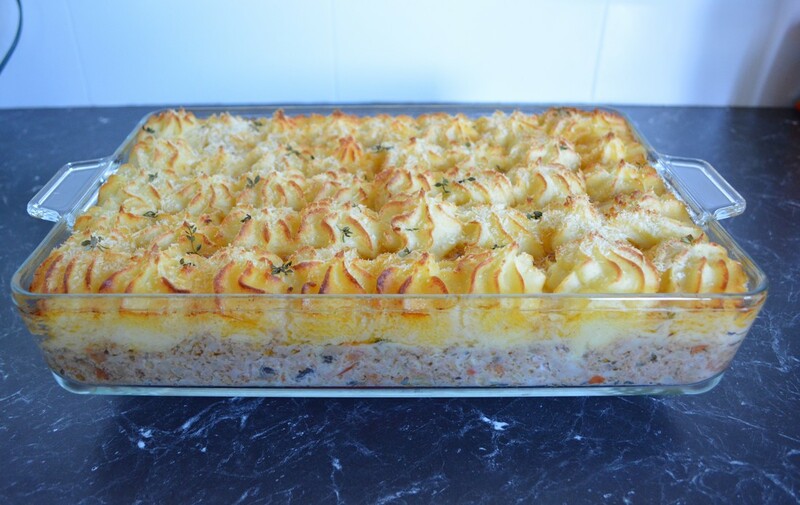 Manu's recipe was for individual cottage pies, I chose to double the recipe and make a large family sized pie. By doubling the recipe, cooking the mince took longer, as there was more liquid to reduce. 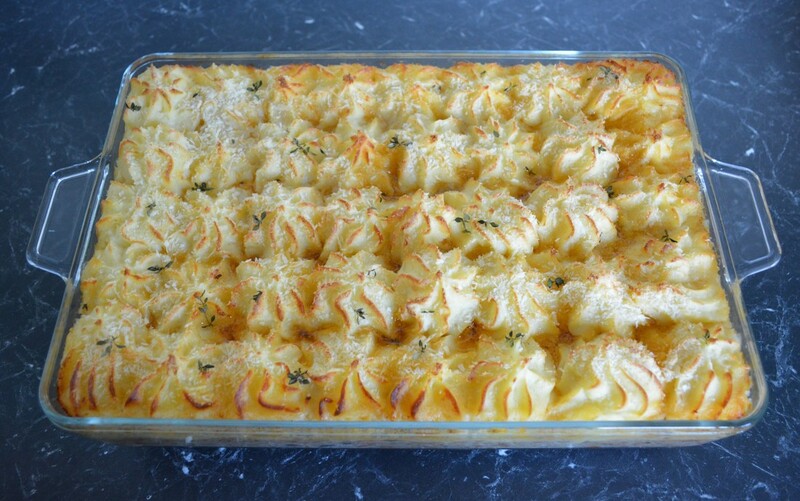 But this is easily something you can prepare earlier, then just make the mash when you need to serve it. Make sure the mince mixture cools before adding the egg, as it will scramble, and mix it in quickly when you do add it, to prevent scrambling from happening. Now for the mash, this was the most perfect mashed potato I have ever had the pleasure to try, as soon as I mixed in all of the ingredients I new it would be fabulous. It was smooth, it was rich, it was AMAZING. I will forever be making this mash for my family. Add the milk in slowly, you may not need it all, add only as much as is needed to make the mash creamy but not a sloppy mess. Also Manu pipes the potato on to the mince and I do it to, it looks pretty, but sometimes could I be bothered to do this, no, but this mash is so brilliant, you can gently dollop it all over the mince and then it allows you to carefully swirl it about with a spoon to make it look nice, as pictured here below. Manu's recipe uses Beef mince, I as a rule use combined Pork and Beef mince in most of my cooking, I find it gives a lighter flavour, so use whatever you prefer. He even says you can use finely chopped leftover cooked beef-I however did not try this, but think I will next time I have leftovers). Over all this was a great family friendly dish I will definitely be making again and again. Heat the oil and 20g of the butter in a large frying pan over medium heat. Add the onion, eschalots and garlic. Stir for 5 minutes or until the onions have softened. Add the mince, cook, stirring, breaking up lumps as you stir it. Cook for 5 minutes or until the mince browns. Add the mushrooms, stir them through for 2 minutes. Add the tomato and stock. Add the leaves from the 2 sprigs of thyme. Season with pepper, add vegeta now, if using. Bring to the boil, reduce the heat to medium-low, simmer for 25 minutes or until the liquid is nearly evaporated. Season with salt and pepper, if needed. Set aside to cool. While the mince is cooling, cook the potato. Place the potatoes in cold water, season with salt. Bring to the boil and cook for 20 minutes or until tender. Drain well. Use a ricer (if you haven't got one, buy one, it is the best thing for making mash perfect) or potato masher, mash the potato well. Add the milk, 1 egg yolk and the remaining 60g butter. If you use a ricer stir this through the potato, if using a masher continue mashing the butter into the potato, until smooth and creamy. Season with salt and white pepper. Add the whole egg and reserved egg white to the mince mixture, stir it through quickly so it doesn't scramble. 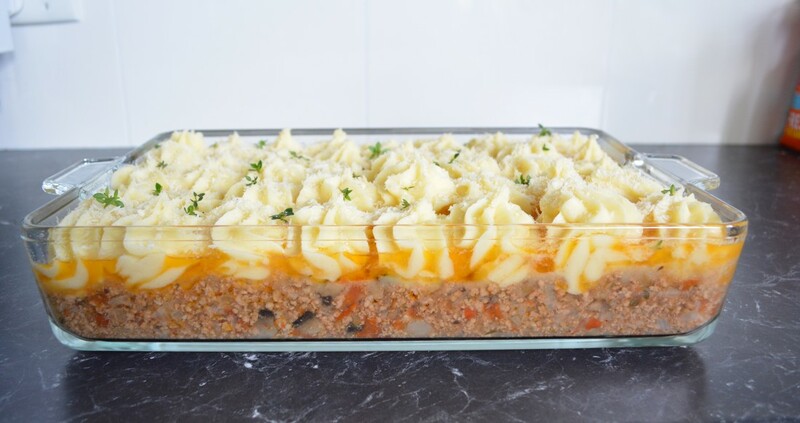 Now spoon the mince mixture into four 500ml (2 cup) ovenproof dishes or one large 2.5 litre dish. Smooth the top. Spoon the mash into a piping bag fitted with a 1cm nozzle. Pipe mounds of mash over the mince to cover the mince. I actually used a spoon to gently dollop it on instead, easier, then I just swirled the potato around carefully to make it look nicer. Sprinkle over the breadcrumbs and thyme. 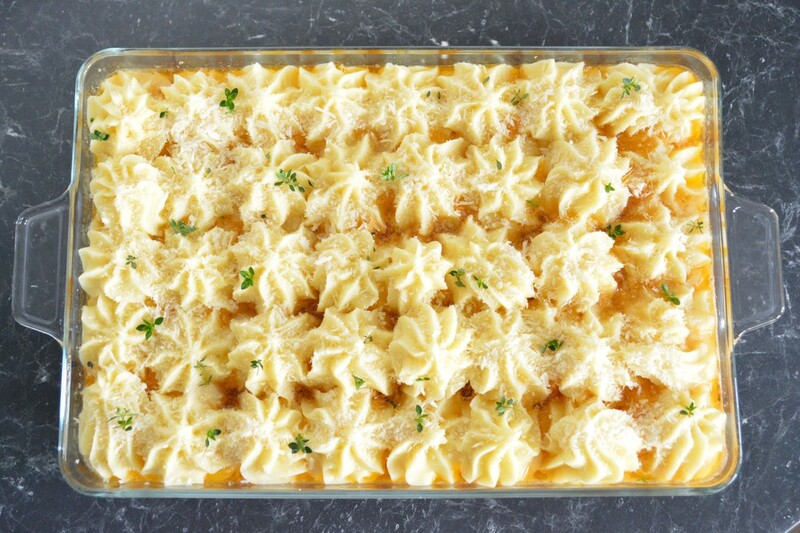 ​Bake for 35 minutes or until the potato topping is golden and crispy.